"Who's #1? 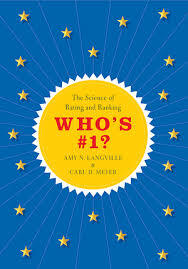 is an excellent survey of the fundamental ideas behind mathematical rating systems. Once a realm of sports enthusiasts, ranking things is becoming a vital tool in many information-age applications. Langville and Meyer compare and contrast a variety of models, explaining the mathematical foundations and motivation. Readers of this book will be inspired to further explore this exciting field."